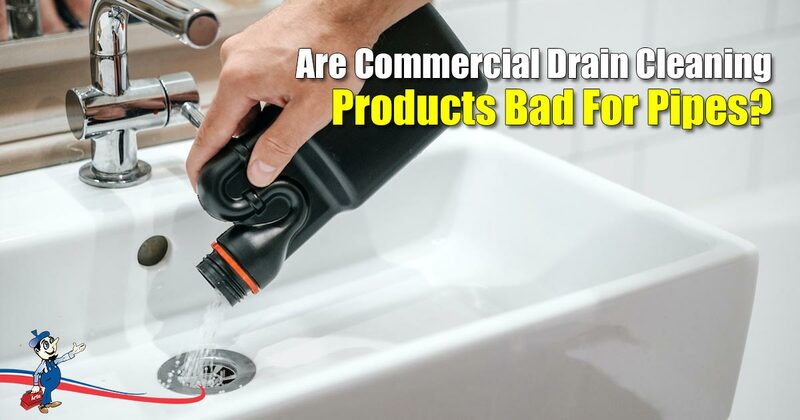 Commercial Drain Cleaning Products: Friend or Foe? It’s a sinking feeling – you wash your face, pull out the plug and the water doesn’t budge. A blocked drain can really mess with your day. The quickest solution is to grab a bottle of commercial drain cleaner, but before you do that, read this. How Do Commercial Drain Cleaning Products Work? There are three types of chemical drain cleaners. With a main ingredient like sulphuric acid, this type of drain cleaner makes short work of dissolving organic material, including hair and other human waste. The downside of this level of potency is that it will also burn through your skin just as quickly if you spill some by accident. Sodium or potassium hydroxide is used in alkaline drain cleaners that are cheaper to produce and retail for less. They are not as strong as the acid-based cleaners and therefore, marginally safer. Drain cleaners that contain bleach, peroxides and nitrates. They work by causing the blockage to become oxidized, as well as releasing gas and heat to clear the drain. All three types of chemical drain cleaners work on dissolving the obstruction in your plumbing by creating chemical reactions. These harsh substances are strong enough to break down most blockages, but this means they have the potential to cause damage to you and your plumbing too. So, What’s The Trouble With A Quick Fix? While they seem to be the most convenient and cost effective answer to a blocked drain, commercial chemical drain cleaners are not an ideal remedy for your plumbing problems for a number of reasons. If the cleaner you pour down your drain does not clear the blockage away completely, you’re left with a highly caustic liquid pooling in your plumbing pipes. Heat is created by the chemical reactions. This can soften PVC piping, or corrode older metal pipes. If you decide to try a second dose to open up a particularly stubborn build-up, the pooling will worsen and speed up the damage. This could lead to a burst pipe and possible injuries if someone gets too close to the spilled drain cleaner. Spilling commercial drain cleaning products onto bathroom or kitchen fittings, tiles and other surfaces can cause damage that is both ugly and not always easy to repair. They give off fumes that irritate the nose, eyes, and throat. Breathing in these fumes can be poisonous. Spillages can cause serious skin wounds and burns. If you have small children, keeping poisonous chemicals in your home increases the opportunity for serious accidents. While it is common sense to keep poisons out of the reach of curious small hands, all it takes is a moment of absent-mindedness for trouble to happen. Residue chemicals left behind in bottles that are thrown away will end up in landfills and leak out into the surrounding groundwater. From here, they seep into larger bodies of water and can poison fish and other wildlife. Bio-clean® is an environmentally safe, 100% natural, biological drain cleaner. Biological drain cleaners work more slowly as they digest the waste safely without causing any harm to the plumbing or the environment. It is perfectly safe for your two-legged and four-legged family members. For more information, or to get your supply of Bio-clean®, call Art Plumbing, AC & Electric. Need a more urgent intervention? A licensed plumber from Art Plumbing, AC & Electric will be able to help you with the best course of action for your plumbing problem.